Accra, April 15, GNA - Dr Nyaho Nyaho-Tamakloe, newly elected chairman of the Ghana Football Association (GFA) has been inducted into office to begin his three-year mandate. The medical practitioner who won the position unopposed following the withdrawal of the other competitor, Dr Kofi Amoah , moments before the election, received the symbol of office from out gone chairman, Mr Benjamin Koufie at a short ceremony in Accra. 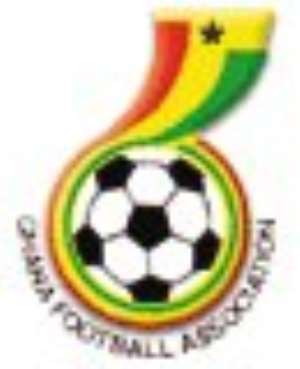 The ceremony to usher the new chairman into office took place at the on-going annual GFA Congress currently underway in Accra and it was witnessed by stakeholders of soccer in the country. Dr Nyaho-Tamakloe who assumed office today accepted the mantel and pledged his desire to work together with his team for the development of Ghana soccer. The man who is known for his strict disciplinary measures is expected to work directly with a five-member management committee with Mr Amoah becoming an automatic member . The three others includes two members yet-to-be selected from the Ghana League Clubs Association (GHALCA) and Mr Aloysius Denkabe of the University of Ghana. The 61-year old medical practitioner polled 30 votes out of the 33 votes cast at the elections to win the chairmanship slot with three abstentions. The Chairman is credited with his days as the Chairman of Accra Hearts of Oak Sporting Club where he raised the famous " Musical Youth" in the late 80's to compete in the then National First Division League after haven "ransacked an entire matured squad". Dr Nyaho-Tamakloe and Mr Kofi Amoah, who is Chairman of the 2008 Nations Cup Bid Committee were nominated by the government to contest the elections but the later withdrew few minutes before the start of the elections citing tight business schedules for his withdrawal.